I can't believe June is already over. Wasn't it just May? Do I say this every month? Time just flies, I guess. 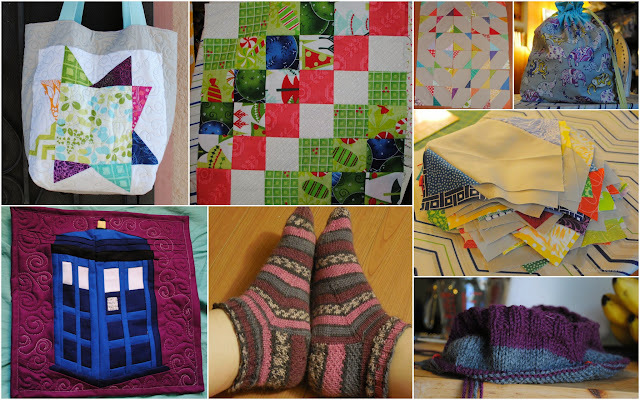 TARDIS wall hanging, first knit socks, stitch and flip block pile, first knit sweater. I really love all the projects I've been working on this month. I have gotten a little sidetracked from the stitch and flip quilt, but I should really get back to it. I want to send it to a friend as a wedding present and his wedding is at the end of this month! EEP! What did you get done this month? Linking up to Fresh Sewing Day and Small Blog Meet at Lily's Quilts! Before you go! This week is my week on the Let's Get Acquainted blog hop! Come back later in the week for a swoony picture and some fun facts about me! :) Be sure to check out the other awesome ladies this week, too! I love the layout of your stitch and flip top! Hi... Found your blog through Lilys small blog link up. Loving those socks! First pair? Way better than my ripped so many times I gave up attempt at socks hehe. Lovin that tote bag! Nice work on what you did in June. I agree really hard to believe another month went by! Your mosaic is looking great. The stitch and flip is coming on really well and I LOVE your socks! Oh my god, the TARDIS! I love that shade of purple with it. Maybe you could post it to Kollabora, the crafting community I'm part of? I'm trying to build up a geekcraft contingent over there. WiP Wednesday: Trying not to Procrastinate!